Assistant Chief Stan Pye. File photo. The Peachtree City Police Department will be hosting a springtime Community Emergency Response Team (CERT) class beginning in March and is seeking interested participants. 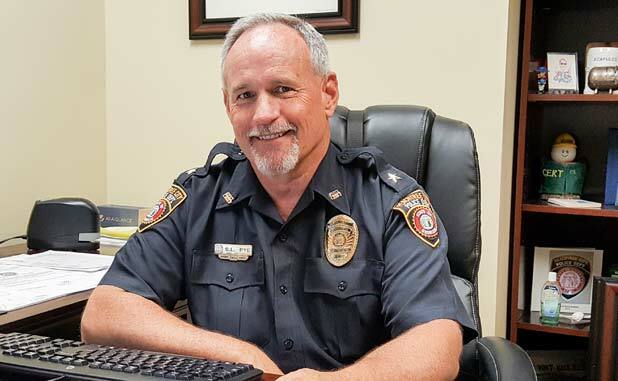 Assistant Police Chief Stan Pye said the classes are offered free of charge and will offer participants a highly informative and interesting learning experience. Prospective candidates must be at least 18 years of age and a Georgia resident. Applicants will be required to sign a waiver of liability form and will be subject to a background check as a pre-condition of acceptance into the program. Class size will be limited to the first 24 applicants accepted. The application deadline is Feb. 28. More information on the CERT Team can be obtained by visiting www.cert-peachtreecity.com, the Peachtree City Police Department’s Facebook page or calling 770-487-8866. Classes will begin on March 7 and will be held each Thursday for 10 weeks, concluding on May 16. Classes will begin at 6:30 p.m. and end at approximately 9 p.m. Applications are available online or may be obtained in the lobby of the police department, located at 350 Ga. Highway 74 South.